Master Barbara Dickens, 8th Dan Black Belt, began her martial arts training in the early 1970s in Singapore. She had always been interested in martial arts, but at the time, women were discouraged from training. She seized her first opportunity to train in Singapore, and even though her first instructor tried to run her off and refused to let her test, Master Dickens never gave up. Back in the States, she finally earned her black belt under world-renowned Grand Master Pyung Soo Kim. Master Dickens founded White Horse Academy of Martial Arts on November 1, 1992. She created her own martial arts system known as Universal Way that encompasses Karate, Tae Kwon Do, Hapkido, and Kung Fu. With over 40 years of martial arts training and 35 years of teaching experience, Master Dickens has become one of the highest ranked female black belts in the United States. In addition to her school, Master Dickens and her instructors teach martial arts in the Houston Independent School District and in several private schools. Stan Campbell, 5th Dan Black Belt, began his martial arts training in 1985 under Grand Master Pyung Soo Kim. He started martial arts because his son was training, and he decided to participate as well rather than sit and watch. He joined Master Dickens in creating White Horse. In 1992, Stan Campbell achieved the rank of 1st Dan Black Belt. He continued his training, achieving the rank of 5th Dan Black Belt in 2006, and retired at the end of 2012. Mollie Coym, 4th Dan Black Belt, began her martial arts training in 1990 at the American Black Belt Academy, at the age of 10. Mollie started martial arts because she thought it would be fun to learn. Mollie began training at White Horse in 1994. In 1996, Mollie Coym achieved the rank of 1st Dan Black Belt. She continued her training and achieved the rank of 4th Dan Black Belt in 2006. Ray Wathen, 4th Dan Black Belt, began his martial arts training under Korean troops in Vietnam in August 1967. He earned a 2nd degree brown belt in Imua Kun Tao in 1968 while finishing his Army service. After returning to civilian life, Ray continued his training under Grand Master Kim Pyung in Houston, where he earned his 3rd Dan Black Belt. Ray is now one of the instructors at White Horse. Ray achieved the rank of 4th Dan Black Belt in December 2012 and is now one of the instructors at White Horse. Joe Coym, 4th Dan Black Belt, began his martial arts training in 1999 at White Horse at the age of 19. He started martial arts training because it was always something he had wanted to learn, but never had the opportunity due to his parents’ fear that martial arts is dangerous. Joe is now one of the instructors at White Horse. In 2004, Joe Coym achieved the rank of 1st Dan Black Belt. He continued his training and achieved the rank of 4th Dan Black Belt in 2013. Sophia Conti, 3rd Dan Black Belt, began her martial arts training in 1995 at White Horse, at the age of 4. She started martial arts because she thought it would be cool. In 2001, Sophia Conti achieved the rank of 1st Dan Black Belt. She continued her training and achieved the rank of 3rd Dan Black Belt in June 2007. Laura Beyers, 3rd Dan Black Belt, began her martial arts training in 2003 at White Horse at the age of 15. She joined after seeing Sophia perform in a White Horse demo at the Heights Festival and because her parents encouraged her to get involved after moving into the neighborhood. In June 2007, Laura Beyers achieved the rank of 1st Dan Black Belt. She achieved the rank of 3rd Dan Black Belt in 2012 and is now one of the instructors at White Horse. Sheila Kraatz, 3rd Dan Black Belt, began her martial arts training in 1999 at White Horse at the age of 44. She started martial arts training for exercise and friendship. She had also heard about people breaking boards and bricks and wanted to see how this was done. Her goal was to obtain her Black Belt by the age of 50. In 2005, Sheila Kraatz achieved the rank of 1st Dan Black Belt at the age of 50, breaking a brick. She achieved the rank of 3rd Dan Black Belt in 2012 and is now one of the instructors at White Horse. Matthew Ramirez, 3rd Dan Black Belt, began his martial arts training in 2004 at White Horse at the age of 7. He saw a martial arts performance at school and wanted to try it out for himself. In December 2008, Matthew achieved the rank of 1st Dan Black Belt. He continued his training and achieved the rank of 3rd Dan Black Belt in December 2013. He is currently teaching and training toward his next rank at White Horse. Curtis Dickens, 1st Dan Black Belt, began his martial arts training in 1975. Unfortunately within a couple of years, he lost interest and didn't train for the next 15 years. He decided to pursue martial arts once again after watching his wife progress through the ranks and create her own school. In 1999, Curtis achieved the rank of 1st Dan Black Belt. He currently teaches martial arts at several elementary schools and teaches weapons and sparring at White Horse. Eric Bounds, 1st Dan Black Belt, began his martial arts training in 1994 at White Horse at the age of 3. 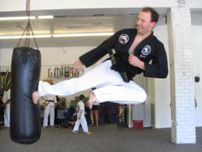 In June 2007, Eric Bounds achieved the rank of 1st Dan Black Belt. Cathy Hildreth, 1st Dan Black Belt, began her martial arts training in 2004 at White Horse. 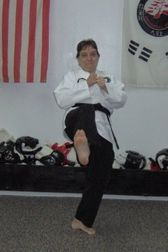 In April 2009, Cathy Hildreth achieved the rank of 1st Dan Black Belt. Mariel Flores, 1st Dan Black Belt, began her martial arts training in 2002 at White Horse at the age of 7. 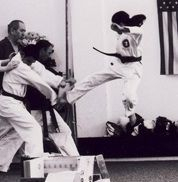 In June 2007, Mariel Flores achieved the rank of 1st Dan Black Belt. Connor Beyers, 1st Dan Black Belt, began his martial arts training in 2003 at White Horse at the age of 12. 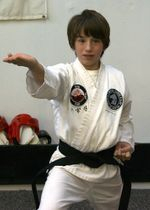 In June 2007, Connor Beyers achieved the rank of 1st Dan Black Belt. To the WHAMA family's grief, Connor passed away on December 11, 2011. The memorial service was held for him within the school. Andrew Sellers , 1st Dan Black Belt, began his martial arts training in 2005 at White Horse. In December 2009, Andrew Sellers achieved the rank of 1st Dan Black Belt. Joseph Conti, 1st Dan Black Belt, began his martial arts training in 2002 at White Horse. In December 2009, Joseph Conti achieved the rank of 1st Dan Black Belt. Will Kudela achieved the rank of 1st Dan Black Belt in December 2009. West Ficken, 1st Dan Black Belt, began his martial arts training in 2004 at White Horse. In June 2010, West Ficken achieved the rank of 1st Dan Black Belt. Ben Schmidt, 1st Dan Black Belt, began his martial arts training in 2008, at the age of 6, at a White Horse after-school program. He continued his training soon after at the main do jang. In December 2013, Ben Schmidt achieved the rank of 1st Dan Black Belt. 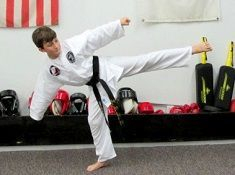 Ethan Eaker, 1st Dan Black Belt, began his martial arts training in 2006, at the age of 5, at a White Horse after-school program. He continued his training soon after at the main do jang. In December 2012, Ethan Eaker achieved the rank of 1st Dan Black Belt. Jesse Flores, 1st Dan Black Belt, began training at age 5 in the after school program and soon continued training at the main dojang. In June, 2016, Jesse Flores achieved the rank of 1st Dan Black Belt.